When people talk about Long Island, they mention its sandy beaches, seaside harbors, and quaint villages. Perhaps the largest, and most hidden, gem among these sites is the Haup­pauge Industrial Park (HIP), the second larg­est industrial park in the nation behind Silicon Valley and a major economic engine serving all Long Island. But for too long, the businesses in the park have been deprived a seat at the table when Town and State budgets are determined, threatening the Park’s success and survival despite its major economic contributions to the state and local economy. It’s imperative that Long Island business leaders help save the Hauppauge Industrial Park and preserve our way of life as dreamers, innovators and build­ers for the next generation. The Hauppauge Industrial Park is an 11-square-mile patch of land located primarily within the Town of Smithtown with a small piece reaching into the Town of Islip. It is a workday home to over 55,000 people, employed across nearly 1,400 companies, run by some of the most innovative entrepreneurs in the country. Its workforce represents almost one in every 20 people employed on Long Island. The companies in the HIP range from light in­dustrial manufacturers and electronics makers to construction and engineering companies to professional services. $13.4 billion in sales volume is generated by Park businesses. $4.4 billion in business expenses are paid by Park businesses. $2.897 billion in total combined Park busi­ness payroll is paid to employees. $2 billion remains as household income to spend locally on Long Island. $806 million of the payroll is taxable in­come. $64.5 million in annual property taxes is paid by Park property owners. The collaboration between the HIA-LI and Stony Brook University on the EIS was no coincidence. Many of the entrepreneurs and workers in the Park are products of Stony Brook University, and finding a home in the Park has enabled them to live on Long Island and make significant economic contributions to our area. In turn, the success of the com­panies in the Park helps boost Long Island’s reputation as a wonderful place to live, work, and study, helping draw students to study at Stony Brook and then stay here after gradua­tion. Stony Brook and HIA-LI are committed to working together to make the HIP as strong as possible. Despite its critical economic impact, the Park struggles to garner the proper attention and necessary resources it needs to survive and compete. This includes lack of legislative as­sistance and budget for tackling critical issues such as workforce housing, transit and shuttle services. Only Suffolk County, which receives the lowest percent.age of tax revenue from the HIP, has supported some infrastructure initiatives such as upgrading the Park sewer system and providing Wi-Fi access. If these critical needs remain ignored, the HIP will not be able to compete and risks be­coming an industrial ghost town, shut down by high taxes, high wages and a nonexistent workforce. Long Island business leaders must do better than this. 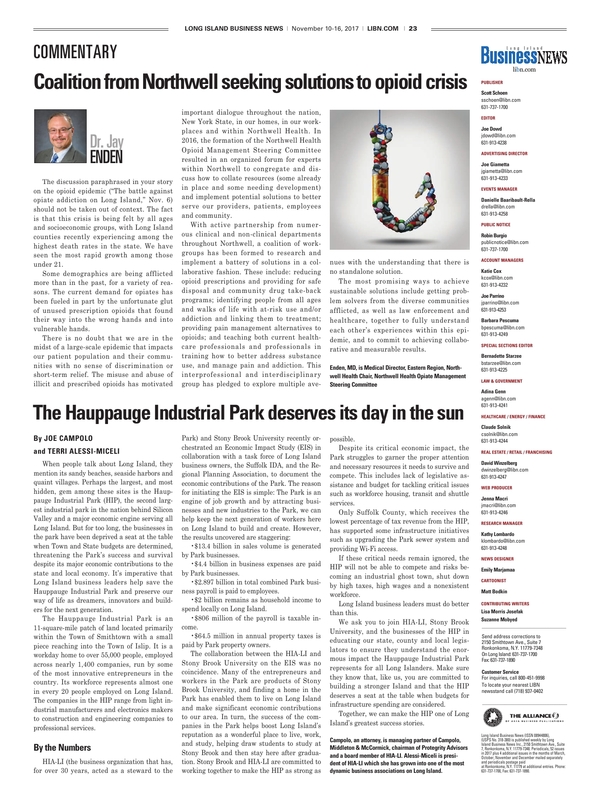 We ask you to join HIA-LI, Stony Brook University, and the businesses of the HIP in educating our state, county and local legis­lators to ensure they understand the enor­mous impact the Hauppauge Industrial Park represents for all Long Islanders. Make sure they know that, like us, you are committed to building a stronger Island and that the HIP deserves a seat at the table when budgets for infrastructure spending are considered. Together, we can make the HIP one of Long Island’s greatest success stories. Campolo, an attorney, is managing partner of Campolo, Middleton & McCormick, chairman of Protegrity Advisors and a board member of HIA-ll. Alessi-Miceli is presi­dent of HIA-U which she has grown into one of the most dynamic business associations on Long Island. People’s Alliance Federal Credit Union will be hosting a seminar titled Women, Money and Power. Dec. 6th, 2017.